Wilson Lake on the Tennessee River System was impounded over 80 years ago. That’s a long time for a man made impoundment to endure the test of time. Being many factors. The mighty Tennessee River System that feeds the lake can show water generation greatly influence aquatic weed growth on this rather small lake, only 17 miles in length. If the lake is suddenly drawn down it can expose a lot of weedy homes. When the lakes lowered these weeds die. If Wilson lake is allowed to get over normal, full pool levels (507.0) it can suddenly cover up the many aquatic weeds growing along the lakes shoreline and feeder creeks. This is when the fish predators such as largemouth bass, move in to feed on the many varieties of prey found within and around these aquatic weeds. Another factor many anglers look forward to is water generation. When the water is released from massive, Wheeler Lake dam it creates a feeding frenzy among the lakes fish inhabitants. Fish gather in huge numbers in the lakes headwaters and they have over a mile wide area, below this dam of current filled waters to explore. All in search of the days next washed in meal. Or your lure. 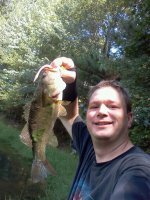 So anglers come from all over the globe to fish these current laden waters often by simply just running the boat up to the dam, then drifting in the current fishing with live bait, cut bait or lures that look like the baitfish and crayfish found here. Wilson Lakes free public boat launch is about a half mile below the dam discharge area. * NOTE * You must wear life jackets when fishing these lake headwaters, it is the law, boaters must have them on when within 800 yards of the dam. You may also be checked by the water patrol for other items such as a throw cushion, fire extinguisher, boat registration papers and fishing licenses. 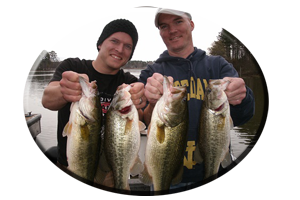 There are hundreds of anglers that come from all over the globe, throughout the United States and from all over Alabama and surrounding states, to fish Wilson Lake. Many of them are looking for a one of a kind of trophy fish found in Wilson Lakes waters. The smallmouth bass. Wilson Lake has given up one world record smallmouth bass and anglers that fish this lake with any regularity believe there is another one here. There are many lures (both small and large ones), these smallmouth bass will hit throughout the fall season. 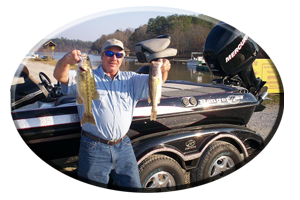 Topwater Lures – These lures get the attention of Wilson Lake’s schooling bass and early morning or late evening bass, usually feeding during low light periods. But it does not mean a bass will not hit these type of lures right in the middle of the day. Prop-baits, popping type topwaters and walking type topwaters all look like the many meals washed in this lake. A bass will bust any of these topwaters and dozens of other topwaters, if its hungry and nearby. Mid-running Lures – This can be shallow to mid diving crankbaits, floating and suspending two hook and three hook model jerkbaits, rattling lipless lures, in-line spinners, even weightless lures like soft shad imitations, Senkos and floating worms. There are a lot of bass that suspend in mid water depths in Wilson Lakes headwaters and surrounding rock bluffs, usually in less than 10 feet of water. These mid depth lures are good lures for reaching them and getting those reaction strikes in the swift current, other lures may not entice. 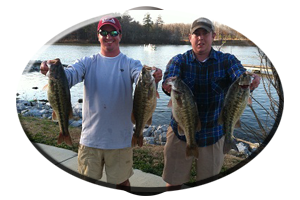 Bottom Lures – This can be small worms, mid-size worms or worms in the 10-12 inch size. Or small 4 inch lizards, 6 inch lizards and 8 inch lizards. Crayfish imitations can be soft plastic crayfish rigged on a jig head, Texas rigged, Carolina rigged or drop shot rigged. These rigs are good for other soft plastics. Creature lures with several trailing appendages are excellent here in Wilson lakes headwaters. Tube baits and Jig combos are good to. 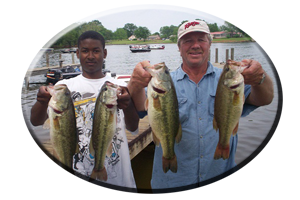 Bring plenty of each lure in various sizes and all colors and experiment. Also bring plenty of hooks, jig heads and sinkers. You will hang up a lot on these rocky, lake headwaters. 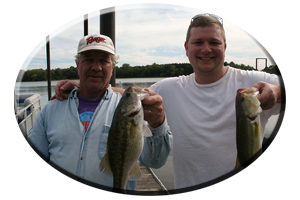 Jigging spoons or fishing with tailspinners are good lures for all fish species in Wilson lake. Again, bring plenty of spoons in all sizes, usually of 1/4 to 1/2 ounce. They do hang up and you will lose some in a day or two of fishing Wilson Lake. Fishing the lakes headwaters, its incoming feeder Creeks, rock bluffs or some of Wilson’s hidden, underwater mid lake humps and drop-offs, an angler can actually have a chance at connecting with one of these trophy sized jumping, brown bass. This can take place on any outing here this fall and winter season. Be prepared with new line, sharp hooks, a good net and a good net man. Getting these smallmouth bass in the boat is another thing. Actually, just landing a huge, tackle-testing smallmouth bass is a real bonus in itself…one many anglers fail to get rewarded with. Planning a trip to Wilson Lake this fall and winter season? The colder it gets, the bigger the bass get and far less anglers on the lake. Always call on Reeds Guide Service…first!